Administrators play a crucial role in organisations by handling day-to-day tasks and making sure businesses run smoothly. This sort of work requires a strong sense of responsibility, accuracy and attention to detail. Administration covers roles that involve organising people and resources, including personal assistants, secretaries, administration assistants, data entry clerks and office juniors. 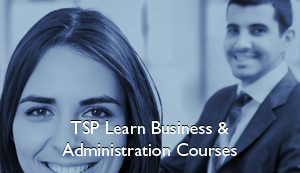 In addition to achieving recognised, externally accredited qualifications, your TSP Learn Business and Administration Course will provide you with transferable skills which mean you could find employment in almost any type of business. Administration roles are also an excellent starting point to move into management.